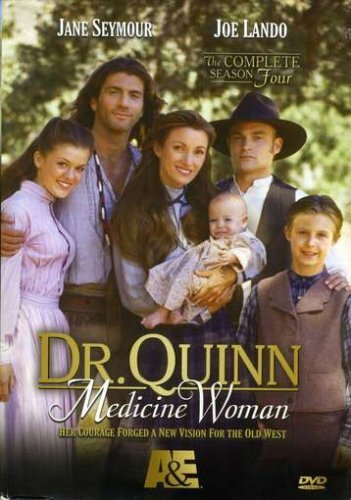 Dr. Quinn Medicine Woman (The Complete Fourth Season) - BUY THIS DVD! Set in the 19th century, DR. QUINN, MEDICINE WOMAN involves the turbulent life of a doctor who makes a new life for herself in the wilds of the Colorado Springs. Michela "Mike" Quinn (Jane Seymour) is the doctor in question, who leaves the safe surroundings of Boston in order to bring more advanced medical practices to a brand new frontier. The action centers around her life, her family, and the people she treats in the local town. She chooses to raise three children after their mother passes away from a fatal rattlesnake bite, which perfectly illustrates her kind nature and willingness to help others. This release presents season 4 of the show in its entirety, with 27 episodes included. Having won 5 Emmy awards, the show has firmly established a place for itself in the televisual history books, and devoted fans of the series are sure to be delighted at this chance to own further installments of this gripping period drama. [b]HOW TO WIN? SIMPLE. SEND IN YOUR NAME AND ADDRESS TO contests@efilmcritic.com. Put "PAGING DR. QUINN" in the subject line and cross your fingers. We will draw names it could be yours. Only 1 entry per household.